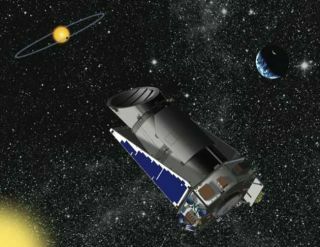 NASA's Kepler space observatory is back up and running after a computer malfunction stalled its search for alien planets for six full days. "An anomaly response team will continue to evaluate the spacecraft data to determine the cause of the safe mode event," Kepler mission managers explained in a written update. The glitch occurred on March 14, when Kepler's onboard systems ordered the spacecraft's network interface card to begin a computer program update. The card is a key component in Kepler's subsystem interface box and provides a link between the space observatory's flight software, attitude control and other sensors and control subsystems, mission managers said. While Kepler's computer program was updating, the network interface card sent faulty data to the spacecraft's flight software, sending the observatory into safe mode. Safe mode is a hibernation-like state that spacecraft enter when their onboard computer detects an operational state or malfunction that it is not able to solve on its own. During the event, Kepler shut down all non-essential systems – like its main science instrument – and orientated itself to point its solar arrays at the sun. "This safe mode orientation provides the vehicle with the maximum power and limits the buildup of momentum from solar wind," Kepler mission managers said. To do that, the spacecraft is staring continuously at a single patch of the sky, watching for tiny changes in the amount of light coming from every star it sees – a sign of a potential planet crossing (or transiting) in front of its parent star, as seen by Kepler. Astronomers use other telescopes to follow up Kepler's findings in order to confirm whether or not the candidate stars do, in fact, host exoplanets. To date, Kepler has discovered 1,235 possible planets, with 54 of those candidates located within the so-called "Goldilocks zone" a just-right habitable zone around a star in which liquid water could exist on a planet's surface. Based on the amazing wealth of planet candidates from Kepler, astronomers have estimated that our Milky Way galaxy could hold as many as 50 billion alien planets, with 2 billion of those being about the size of Earth.